At this year’s National Restaurant Association, some strong new trends were seen across the trade show floor. Want to see what your local restaurants will be offering soon? 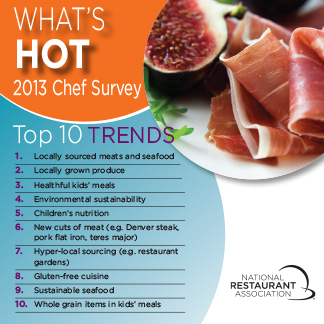 Here’s the list on NRA trends and also a What’s Hot list from Chef’s across the country. What you see here is also being replicated in our grocery stores. 1. Healthy Kid’s Food. What? No fried chicken tenders? Looks like schools will be offering baked snack chips made with whole grains, whole wheat crackers and granola clusters. 2. Tropical flavors. Fruit basket turnover: Passion fruit, guava and especially mango were prominently on display, particularly flavoring iced teas and desserts. Coconut was on many desserts, too, possibly benefiting from the popularity of coconut water. 3. Water. Yes, that’s right. Water is hot (or cold)! It’s zero-calorie “enhanced waters,” fortified with vitamins, water filtration systems, seltzer with splashes of fruit juice, aloe water and just plain bottled water. 5. Greek yogurt 2.0. Greek yogurt in everything – Greek yogurt cheesecake, spinach-artichoke dip, mac and cheese, and virtually anything that would otherwise contain mayonnaise or sour cream. 6. Gluten free. Even products that are naturally gluten-free are promoting their freedom! 7. High-tech convenience. Think slow local done fast. One company had a miniature chocolate factory that allowed restaurants to roast, grind and conch their chocolate in-house. 8. Salted caramel. Enough said. Salted caramel pie for everyone! 9. Peruvian. The country of Peru exhibited its wares at the National Restaurant Show for the first time this year, with everything in place to take the world by storm. Our family actually visits Peruvian restaurants in LA where it has been popular for quite some time. Can’t beat an Inca Soda! 10. Superfoods. Show attendees were interested in the healing qualities of cinnamon, turmeric and cayenne pepper; teas were flavored with blueberry, pomegranate and açaí, and fish enjoyed it’s Omega 3 oil qualities. Hey Jamie, great outline. I love watching the culinary trends form year to year. Glad to see that Healthy Kids Meals stayed on top of the list from 2012. If I could share my list from this year’s NRA show, which touches on the above but also includes the increased emphasis on technology. I always appreciate your slant towards marketing to woman. You are currently reading Marketing to Women: Top 10 Culinary Trends for Restaurants at The Lipstick Economy.